Bitcoin doesn’t need an explanation anymore. It’s the first and the most valued cryptocurrency in the world right now. If you heard about Bitcoins, you might also have come across Ethereum or Litecoin or Bitcoin Cash as well. These are altcoins, in other words, these are same as bitcoins with a lesser market value compared to bitcoins as of now. We can’t predict or estimate the power of any of these coins. During hard fork in the last week of November 2017, Bitcoin declined unexpectedly, so did all other coins at a heavier pace. But Dash coin managed to stay well during the fork. So we can’t predict the elasticity of the coin. With more and more altcoins arising day by day, it’s hard to determine whether it’s a scam or genuine. One such coin that got introduced in the market in 2014 was IOTA. The concept of IOTA is different from all other coins. It has a future development perspective. The best advantage of IOTA is it does not incur any transaction fees. The current price of IOTA is at $2.51 as of writing which made a 70% increase in the last 24 hours. So, it’s probably the obvious time to invest in IOTA. Let’s move right onto how to buy IOTA in India. Platforms where coins are called an Exchange. There are a bunch of exchanges available in India like Unocoin, Zebpay or Coinbase. They deal only with Bitcoins and the margin between buy and sell price is relatively high. Currently the best exchange in India is Koinex where the margin is low and they offer Ethereum, Litecoin, Ripple and Bitcoin Cash along with Bitcoin. Unfortunately they don’t offer IOTA trading so does many other exchanges globally. Tokyo based exchange, Binance offers the trade of IOTA in exchange of Bitcoin or Ethereum. To start with, you need to sign up with Koinex. Complete the verification process and deposit the amount you wish to invest. You can use my referral link to get an additional Rs.50 in your Koinex wallet for free. 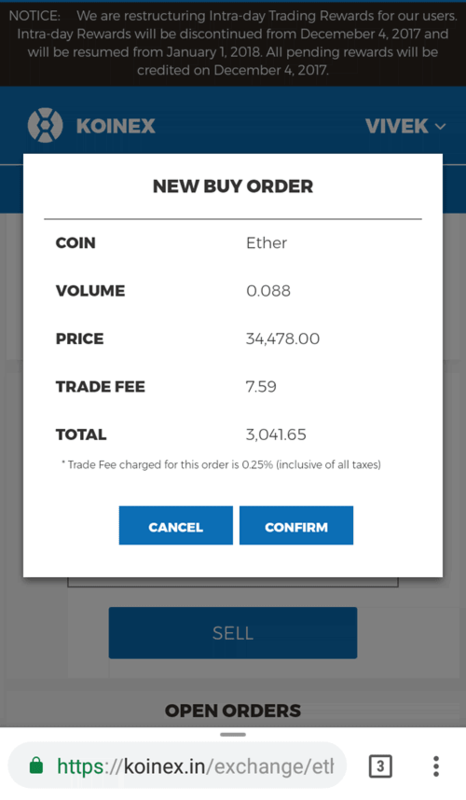 Now in Koinex, select Ether from the drop down menu and go to ‘Buy Ether’ option. I’m going to trade for Rs. 3000 from my phone. To calculate the quantity, you need to divide your INR balance with the current price of Ether. For example, if the current price of Ether is Rs. 34,250, so it will be 3000/34250= 0.87. Now in the box, enter the lowest ask price listed and 0.87. Press confirm and wait for the trade to get executed. Now you have successfully bought Ethereum coins from Koinex exchange. Then you need to transfer these ETH to an exchange that supports IOTA trading. As said, Binance is one such exchange. So sign up with Binance. You can use my referral link if you wish. After signing up in their website, download the app. Login with your details and switch to ‘Funds’ tab. Press the green ‘Deposit’ button to get your ETH wallet address. Make sure you switch from BTC to ETH before copying the address. Now come back to Koinex as you now need to send the Ethereum you bought to the Binance wallet you just created. Go to Koin Transact option in Balance tab. Select ‘Ether’ as wallet and press withdraw. Now enter the quantity of ETH which you bought and the Binance wallet address. Press next and confirm. 0.001 ETH is deducted as withdrawal fees. It may take some time to get credited in your Binanace wallet so be patient. In the last step, open Binance app and search for IOTA/ETH. Select it and analyze the price changes. If you wish to buy now, press the green Buy button. You will see a screen like above. Now enter the lowest price shown in right side in the first box. Play around with the combination and make the purchase. That’s it, you will now see IOTAs purchased successfully with Ethereum. Wait for the coin to flourish and sell it in the future in exchange of Ethereum. Send it back to your Koinex wallet and sell it here to convert it to liquid cash. Happy trading everyone! This post is written and submitted by Vivek. You can leave a comment for any questions you may have from him. I could see coin rates are comparatively higher in Koinex than Binance. In this case will there be any loss in coin value if I transfer ETH or BTC from Koinex to Binance? Yes, you will lose some value as the value in Binance will be reflected as per the current trading rates. do we need any verification done for trading in binance or if we just register it will be enough? It will be enough. Binance doesn’t need verification unless you trade big amounts. I guess it will be wise idea to buy IOTA from sragy.com with INR as they have IOTA/INR market. can i use zebpay for buying Iota? Zebpay supports only Bitcoin now. You can purchase btc from Zebpay, transfer it to Binance and then purchase IOTA from there! How many days will it take to approve the KYC? It just takes over 24-48 hours if you’ve submitted all information correctly and clearly. IOTA trade is not supported in Koinex as of now. After buying from Binance, let it boom. Suppose if it reach $10 you can sell it in Binance and you will get ETH in return. You can then transfer it back to Koinex wallet and sell it for INR. 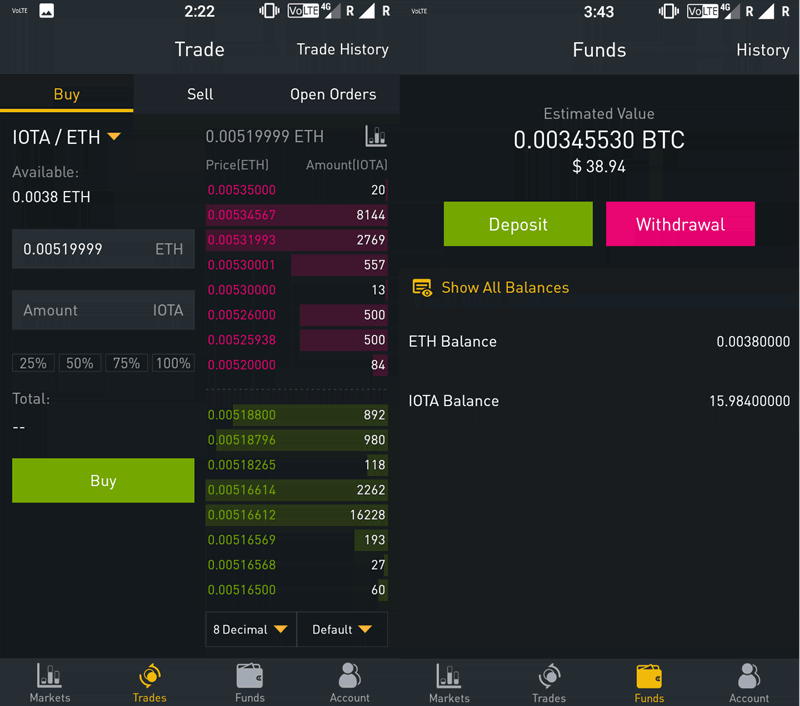 How to transfer ETH from Binance to Koinex? 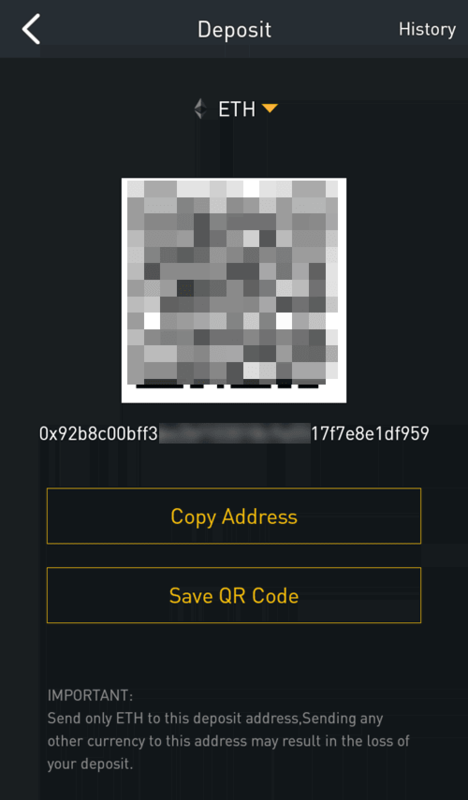 IDENTITY UPDATION ERROR IN BINANCE , HOW TO UPLOAD IT ? You don’t need to upload any documents to get verified. But you need to enable 2-factor-authentication before transferring to another wallet! Is there any loss If I purchase IOTA in exchange of Bitcoin by transferring bitcoin from zebpay to binance?? Comparing both ETH and BTC, BTC transfer charge is high. My name is Manoj Garg from Delhi. I want to buy IOTA coins . I am new in this field. So can you guide me how can i buy IOTA coins in Delhi India from Indian rupees. You have to search for IOTA/ETH, Type in the amount of IOTA u wish to sell and press ‘Sell’ button. As I can see, Binance only accepts BTC as a medium if exchange. No, They accepts US Dollars, Bitcoin, Ethereum and BNB (their own coin). Indians can’t deposit USD in Binance. Instead of INR or USD, ETH and BTC are used for trading.